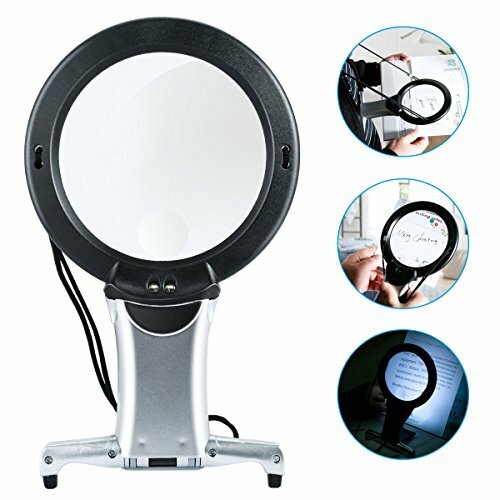 Pull down the back case and turn it a kickstand, non-slip foot pads embedded for stand stability on any table surface, the angle of the magnifying head can adjust as you want; Alternatively, users can also hang it on neck with the unit before chest for handsfree reading. Made with crystal-clear optical grade lenses. This is a lens in lens design, two kinds of lens combined, larger lens with 2X magnification, Smaller lens with 6X magnification, One piece features two purposes. Designed for seniors, kids, students, professionals, and the elderly people with low vision and macular degeneration. This magnifying optical lens will absolutely help you a lot during cross stitch, sewing, embroidery, reading books or making crafts. Crystal clear vision come back again. It works perfectly on various close works with large and clear view for even the old.